Maureen Shul, founding mayor of the City of Castle Pines, Colorado, founded Wings of Hope for Pancreatic Cancer Research in 2012 after losing her brother, Victor, and mother, Blanche, within months of one another to pancreatic cancer. Before moving to Colorado, Maureen was a legislative assistant on Capitol Hill, Washington, D.C., studied theology in New Mexico and started a local insurance-investment brokerage firm. Maureen was instrumental in implementing Colorado Life Trak as a statewide program to safely locate persons who wander and get lost due to medical impairments. Maureen currently facilitates support groups for Alzheimer’s caregivers and is a speaker on the issue of women in leadership. The "WINGS OF HOPE" mask, on behalf of WINGS OF HOPE FOR PANCREATIC CANCER RESEARCH, a nonprofit organization dedicated to raising awareness and funding for the pancreatic cancer ongoing at the University of Colorado Cancer Center, incorporates on the left side of the mask the white wings found on the WINGS OF HOPE logo. 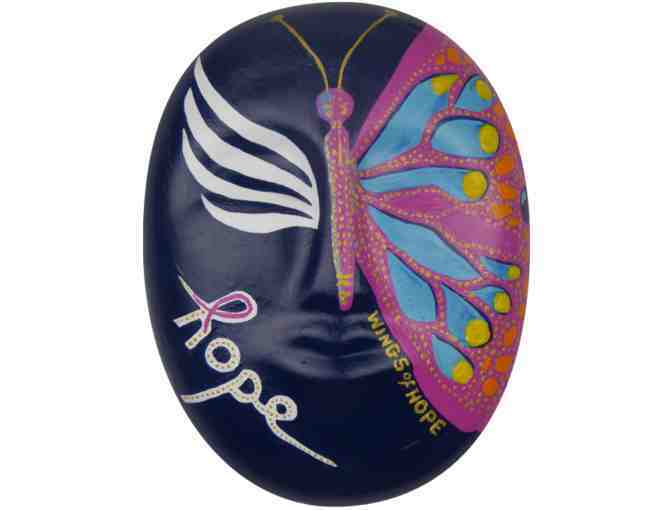 Complimenting those symbolic wings on the other side of the mask are the wings of the butterfly, utilizing the color representing pancreatic cancer, purple and symbolizing the timeless message of enduring, transformative and enternal hope in all things. Your support matters, so The Denver Hospice would like to use your information to keep in touch about things that may matter to you. If you choose to hear from The Denver Hospice, we may contact you in the future about our ongoing efforts. Copyright © 2003-2019 The Denver Hospice and Greater Giving, powered by BiddingForGood, Inc. All Rights Reserved. Designated trademarks and brands are the property of their respective owners.